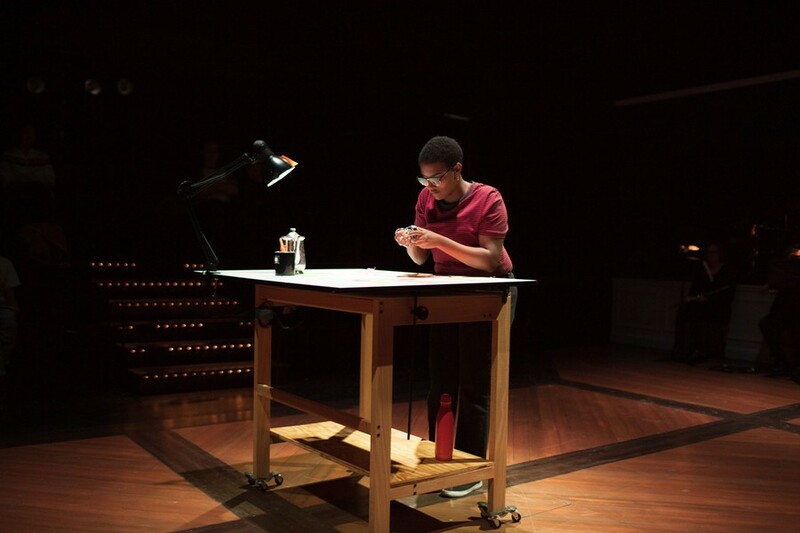 Fourth-year Ri Desta plays the role of cartoonist and graphic novelist Alison Bechdel. Alison Bechdel’s autobiographical graphic novel, Fun Home, is a familiar name to many, either from personal reading, the national attention it attracted, or the humanities Core. Bechdel explores memory and literature, tackling many subjects, including her father’s suicide, his sexuality, her own sexuality, her origins as an artist, and her upbringing at the family funeral home (the Fun Home in question). The book is, to say the least, downright brilliant, which is probably why Lisa Kron and Jeanine Tesori adapted it into a musical. Last week, the University Theater (UT) showcased its own production of that adaptation. Fun Home is a challenging piece of theater, for sure. While certain points of emphasis and presentation stray from the book (the father, for instance, could be said to be a different character in the two works) the complexity of the graphic novel is successfully translated onto the stage. The relationships between the characters, particularly between the various versions of Alison (young, college-aged, and adult Alison), the mother, and the father, are tense and multilayered. And most of the musical numbers are challenging in their own right. But UT’s production rose to all those challenges quite well. It wasn’t perfect, but given the difficulties of the piece and how powerful it is when done right, I was very impressed. If the production struggled anywhere, it was in acting outside of the musical pieces. The performances weren’t poorly executed by any means, but the whole seemed to be less than the sum of its parts. While the characters were individually full of life, their relationships seemed a bit hollow. Particularly within the family, whose members’ conflicted relationships are crucial to the show, the pain and strain weren’t as tangible as they could have been. Without this dramatic core, some of the scenes became a little disjointed and shallow. However, this is only one aspect of the acting and, indeed, many of the actors delivered their roles with exceptional work onstage. Fourth-year Alden Herrera performed Joan deftly and with flair. In a discipline wherein the hardest task is often to show restraint, the punkish confidence that Herrera was going for seemed very genuine and not at all overdone. Another stand-out performance was, again, Lovett. Helen is a very fleshed-out character, both in the original book and in the musical. Her marriage to Bruce is under incredible strain and she has some very intimate moments with Alison. However, she is still somewhat at the periphery of the main plot. Lovett’s performance presented a person who was under intense stress, and she managed to communicate this pressure with commendable subtlety. In her speech, posture, movement, and even her singing, Lovett always projected a sense of poise and self-control that crosses into repression. However, these were only two examples in an overall talented cast. In addition to all of this were the challenges associated with the actual staging of the piece, which are not to be overlooked. The show was staged in the round theater (as was the original Broadway run), and while this is often a challenging and awkward setup, the cast and crew handled it pretty well. In a show with a lot of moving pieces and people hustling and bustling back and forth, everything was smooth, snappy, and pristine. All in all, Fun Home was a skillfully constructed production of a complex graphic novel. Despite some general difficulty, there were more successes than stumbles and the quality of the work was laudable. The hard work of the cast and crew came through in a genuinely touching show that embraces Bechdel’s original message of identity, family, and hardship.